A 66-year-old woman’s mysterious illness that left her feverish and with slurred speech initially stumped her doctors. 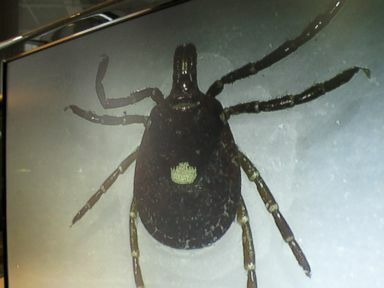 As the woman’s condition continued to deteriorate, an infectious disease doctor eventually identified the cause — the woman had contracted a bacterial disease caused by a tick bite. Researchers from George Washington University School of Medicine wrote about deciphering the medical mystery in a case study published in the BMJ medical journal today. Tick-borne illnesses are concerning to many health experts because the symptoms can be mistaken for other illnesses. The woman from a mid-Atlantic state arrived at the hospital five days after she exhibited symptoms, according to the researchers. She had a throbbing headache, fever, unstable balance and diarrhea. When doctors examined her, they found a large rash on her chest and fluid in her lungs. For more than a day, doctors were unable to pinpoint exactly what was wrong with the patient. Thirty-eight hours after she was admitted to the hospital, the patient started to have seizures, signaling a severe neurological reaction. After spending more than a day and half in the hospital, the patient met with an infectious disease doctor. The doctor suspected a tick-borne illness after hearing that the patient had found and removed a tick from her groin two weeks earlier. The doctor ordered an IV drip of an antibiotic called doxycycline, often given to people with tick-borne infections. A blood test finally revealed that the woman had contracted a rare tick-borne illness called human monocytic ehrlichiosis, the “most common life-threatening tick-borne illness in the USA,” according to the researchers. Caused by bacteria called Ehrlichia, the disease was reported just 1,518 times in 2013, the latest year data was available from the U.S. Centers for Disease Control and Prevention. However, the reported number of ehrlichiosis has been on the rise, according to CDC data. In 2010, just 740 cases were reported, according to the CDC. The fatality rate among people with human monocytic ehrlichiosis is estimated to be between 3 to 5 percent, according to the researchers. The woman eventually recovered after being given the intravenous doxycycline. Unfortunately, for those who enjoy the outdoors in fall, ticks are more prevalent as the weather turns colder, according to Esper. If you a find a tick on your body, don’t throw the insect away, Esper said. Dr. Sabina Anna Rebis is a family medicine resident at SUNY Stony Brook University and a medical contributor to the ABC News Medical Unit.